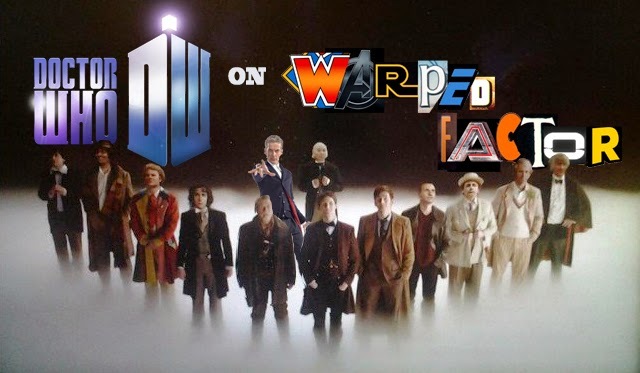 DOCTOR WHO - DEATH IN HEAVEN Spoiler Free Review | Warped Factor - Words in the Key of Geek. Before Doctor Who disappears from our screens for 6 and a bit weeks, we have a Death In Heaven to face. Here's our spoiler free review of the series 8 finale. It's the end, but the moment has been prepared for......by Steven Moffat and all his 'Moffating' across the course of series 8 - yes that's a verb now, goes in the dictionary next year. I said last week that Dark Water was the start of the finale which Doctor Who series 8 absolutely deserved, and after viewing it I'm sure you'll agree that the tone and style were suitably fitting for the many high points we had experienced throughout the previous 10 weeks. I mean, I know it has its champions but a two-part finale resembling the style of Robot Of Sherwood would've been a bit of a sucker punch, no? But we do have a two-part finale, and as with many two-part adventures there's always that fear that the resolve will not live up to the set-up. Let's face it, Doctor Who has shown that to be the case many times before. Well the good news is that Death In Heaven bucks that trend. Whilst not quite as atmospheric as Dark Water, combined they are easily the best series finale we have had since the show returned in 2005. Death In Heaven is something of a difficult one to review spoiler-free, because an awful lot happens right from the off - even in the title sequence. As tempting as it would be to give any hints, I won't. It will surprise you at times. You might think you already have some kind of grasp where it's going...chances are you don't. It's a very serious story, but there are more lighter moments than in Dark Water, and they blend together very well. I have to say that Michelle Gomez is especially brilliant in this one. She's bananas, but she clearly relishes the role Moffat has given her, and as you'd expect Peter Capaldi is amazing throughout. Some of the Doctor's shared moments easily sit amongst his best scenes to date. If you think back to just after Capaldi was announced as the new Doctor, he gave an interview saying that Steven Moffat already had ideas for a Doctor of his ilk. Well it wouldn't surprise me if those ideas are what we experience during Death In Heaven. It just feels like Moffat is finally writing the story he has always wanted to tell. A story without any constraints. No thoughts of "you can't do that, it's Doctor Who". Clearly this has been set in motion for some time, but this two-part finale brings it all to the forefront. As with Dark Water Rachel Talalay adopts a no nonsense approach from the directors chair. There are bigger moments to capture this time, big James Bond style moments, which she does quite perfectly, and again manages to give each scene the exact time needed to play out without any feeling of being rushed (still finding room to discuss Gerry Anderson!). This is obviously helped by the extra 10 minutes of running time, but truth be told Death In Heaven actually feels longer than 56 minutes - in a good way that is. Death In Heaven gives a lot of answers to a lot of questions, and raises a lot of new questions to be asked (but you'd expect that from Moffat, right?). There are also a lot of surprises too. 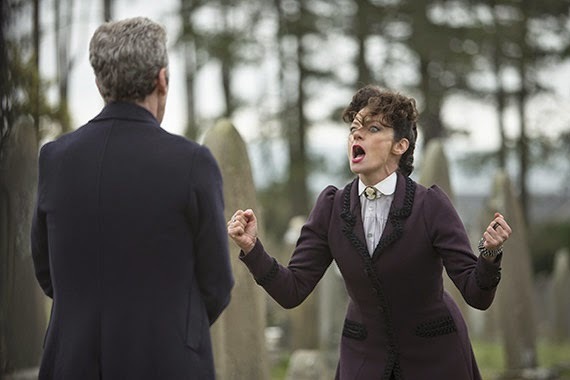 Not least of which when Nyssa announces that Capaldi was the Watcher all along! I'm kidding on that last one, of course. Death in Heaven premiers Saturday 8th November at 8pm on BBC One.